The Great Shipwrecks of NY's "Great" Lakes Signature Exhibit at the 2014 Great New York State Fair will have components in the permanent reflecting pool at the fairgrounds. The "cement pond" is part of the State Park, operated by the New York State Office of Parks, Recreation and Historic Preservation at the fair. Twice daily, at 2 p.m. and 4 p.m., the Great Lakes Research Consortium and the SUNY College of Environmental Science and Forestry (ESF) will demonstrate the use of a remotely operated underwater vehicle/ROV in the pool. Information will be presented on how the high-tech equipment is used to further a science-based understanding of the Great Lakes. 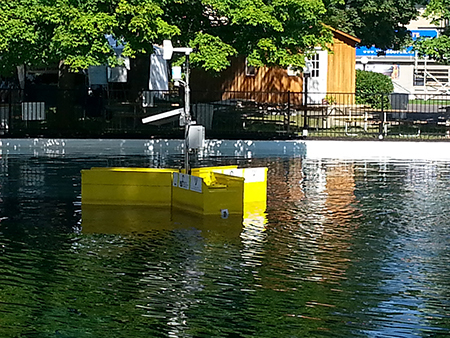 Throughout the 12-day fair, Aug. 21-Sept. 1, a weather buoy equipped with a real-time, 24/7 weather station will broadcast current weather conditions from the pool. With funding from the Great Lakes Observing System, the U.S. Environmental Protection Agency Great Lakes Restoration Initiative and others, the Great Lakes Research Consortium has a series of these real-time monitoring stations located across New York state. scuba-equipped mannequins from National Aquatics Service showing how diving gear has evolved since the 1950s. Coastie, the talking safety boat mascot of the U.S. Coast Guard Auxiliary. Nearby, the New York Sea Grant Launch Steward Program and U.S. Coast Guard Auxiliary will have the 10-foot "mouse boat" that is the 2014 New York Sea Grant Discover Clean and Safe Boating education vessel on exhibit. Stewards and auxiliary representatives will be educating visitors about safe boating and diving and how boaters can use the easy Clean/ Drain/Dry watercraft inspection method to help slow the spread of aquatic invasive species. "A great deal of the history of New York state can be found underwater and we are pleased to help share some of that history with the people of the state. This will be an exciting and stimulating exhibit. I urge everyone to make time to visit it. You will learn something surprising!" said State Fair Acting Director Troy Waffner. "New York state is home to some of the most important and historically-significant shipwrecks in America. The State Fair exhibit will educate visitors about some of this history that took place right in our own backyards," said New York Sea Grant Coastal Recreation and Tourism Specialist and Great Lakes Research Consortium Associate Director Dave White. New York Sea Grant and the Great New York State Fair developed the Great Shipwrecks of NY's Great Lakes Signature Exhibit in partnership with the Great Lakes Research Consortium, Lake Champlain Sea Grant, Lake Champlain Maritime Museum, H. Lee White Marine Museum, Great Lakes Seaway Trail, and U.S. Coast Guard Auxiliary. Exhibit funding is from a federal National Scenic Byway grant obtained for promoting the 518-mile-long Great Lakes Seaway Trail region by the late tourism leader Teresa Mitchell.